Yesterday, I made a quick collage of my outfit of the day. I wore the Limited Edition NYC Murfee Scarf from Lilly Pulitzer with a plain long sleeved painter's tee from J. Crew, a cardigan from Vineyard Vines, Pixie pants from J. Crew and black sequin flats from Kate Spade. After I posted the picture on Instagram, I received quite a few messages to ask how to tie the scarf, so I decided to create a tutorial. Here's one way you can tie your Murfee Scarf. 1. Fold scarf in half lengthwise and put it around your neck. You'll have two ends on one side and a loop on the other side. 2. Weave 1 end of the scarf over the loop. 3. Then weave the other end of the scarf under the loop, almost like a basketweave. 4. Adjust at the neck to get it the way you like it! 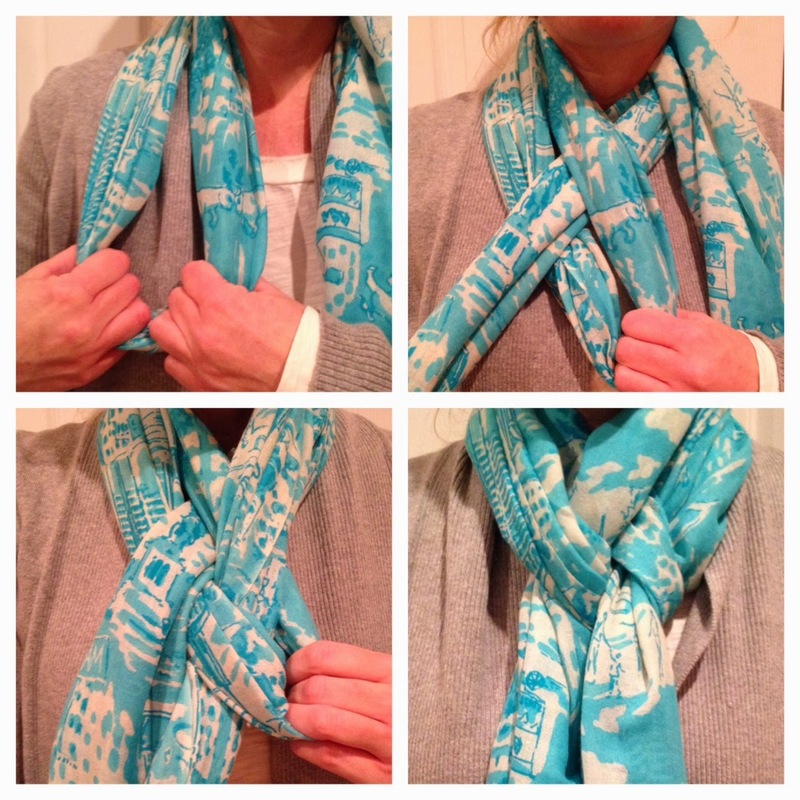 If you picked up a scarf in Lilly Pulitzer's New Year Cheer Sale, try this fun way to tie it! More scarf tutorials to come! Have a wonderful day and stay warm. We're expecting a high of 10 degrees today. Brrrrr. Fun! I'm going to have to try that.